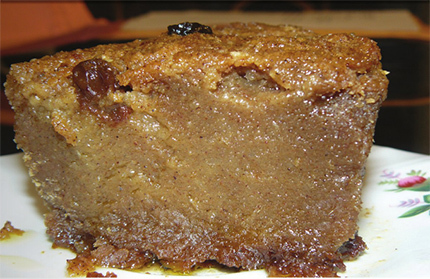 Pen Patat (Sweet Potato Pudding) is a classic dessert that is traditionally served in Haiti. There’s truly nothing like a warm slice of pen patat – so delicious! Cut the sweet potatoes into 1 in cubes then grate them using a blender. Place them into a mixing bowl. Peel and mash the banana into the sweet potatoes. Add the remaining ingredients. Mixed all until well blended. Transfer onto a pot and cook over medium heat, stirring constantly with a spoon for about 30-35 minutes until brown. Place in a baking pan and bake for 1.5 hours or until toothpick inserted into the center comes out clean.